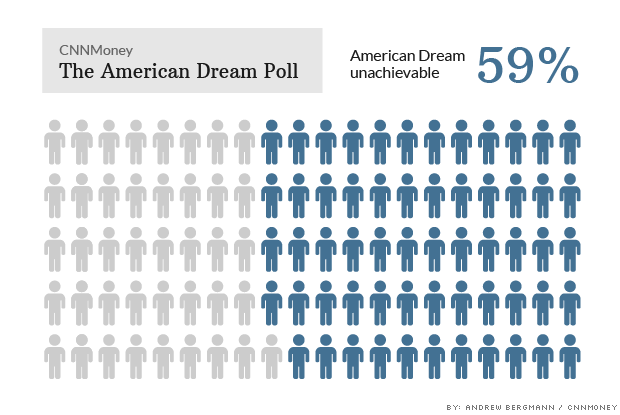 So say nearly 6 in 10 people who responded to CNNMoney's American Dream Poll, conducted by ORC International. They feel the dream -- however they define it -- is out of reach. 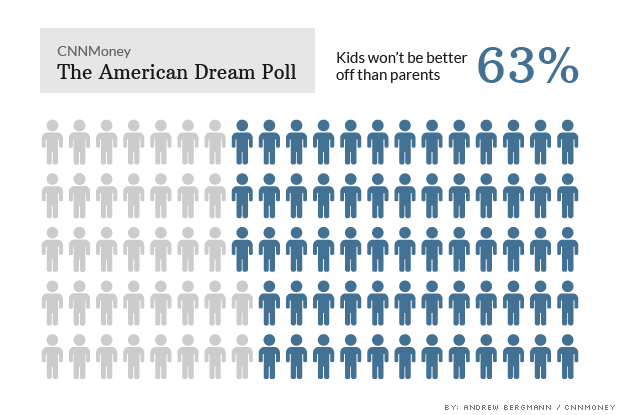 Young adults, age 18 to 34, are most likely to feel the dream is unattainable, with 63% saying it's impossible. This age group has suffered in the wake of the Great Recession, finding it hard to get good jobs. Younger Americans are a cause of great concern. Many respondents said they are worried about the next generation's ability to prosper. Some 63% of all Americans said most children in the U.S. won't be better off than their parents. This dour view comes despite most respondents, 54%, feeling they are better off than their own parents. The downbeat mood is not surprising, say economic mobility experts. "The pessimism is reflective of the financial realities a lot of families are facing," said Erin Currier, the director of the Economic Mobility Project at Pew Charitable Trusts. "They are treading water, but their income is not translating into solid financial security." The vast majority of Americans have higher incomes than their parents, but that's in large part because most families have two earners now, she said. Only half have more wealth, she said. Meanwhile, the savings rate is low and unemployment is high. College costs are rising faster than inflation and student loan debt is exploding. Share your story: Have you achieved the American Dream? People also tend to be more pessimistic about the next generation's fortunes in general than their own children's prospects, Currier said. In Pew's polls and focus groups, parents say that it will be tougher for their children to succeed, but they still believe it's possible. Perceptions, however, aren't supported by the facts, experts said. The American Dream is not dead, said Ron Haskins, co-director of the Brookings Center on Children and Families. Two landmark studies released earlier this year concluded that mobility is worse in the U.S. than in many other developed countries, but has not changed significantly over time. Researchers found significant differences in mobility across the nation. Those who live in areas with higher economic growth and better schools have a greater chance to climb the economic ladder. The studies also found that areas with large African-American populations, such as the South, have lower rates of mobility for all residents. "Mobility is an issue, but it hasn't gotten any worse," Haskins said. CNNMoney's American Dream Poll comes from telephone interviews with 1,003 adult Americans, conducted by ORC International from May 29 to June 1, 2014. Both landlines and cell phones were included in the sample.